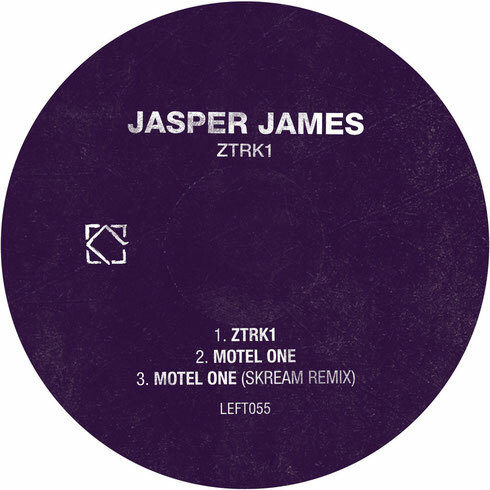 Glasgow based DJ/producer Jasper James releases ‘ZTRK1’ on Matt Tolfrey’s Leftroom records, featuring a remix from Skream. 24-year old Jasper’s debut production dropped on Optimo Trax in 2014 to support from the likes of Bicep, Eats Everything, Skream and Jackmaster while, as a DJ, he has quickly developed a strong reputation with shows at venues including Fabric, Warehouse Project and Space. Having dropped an Essential Mix in May 2014 as well as a regular Rinse show, James’ reach continues to grow. First track ‘ZTRK1’ opens in a flurry of arpeggiated bleeps before getting down to business with a pulsing acid bassline, steely hi-hats, and a mutating synth hook while ‘Motel One’ gets straight to the beat for a no nonsense piece of techno that offers surprise moments of euphoria as it wends its way. Finally Skream, fresh from success with ‘Still Lemonade’ on Crosstown Rebels, adds a dark, throbbing energy to ‘Motel One’ with hypnotic, undulating pads, rhythmic bass and a cascade of top notes. It’s out on 1 June on Leftroom.